Gorgeous weather...excellent performances...great cameraderie...and unique food produced a memorable evening at the 3rd annual Wanderers Distance Track meet at the Roxborough High School track on August 22. A mixture of Philadelphia track veterans as well as many new faces produced some superb races with Kevin Forde, Austin Perron, Steve Metraux, Chuck Shields, Chante Moore and Mark Bond all coming up winners. Kevin started things off with a victory in the one mile run finishing in a time of 4:45, with second place finisher Steve Metraux and third place finisher Andrew Bove breaking five minutes. Laura Fanelli won the women's division in 5:20. Mark Bond won the second heat in 5:24 nipping Bryson Lipscomb by a second and veteran Tom Yunker coming in third in 5:41. Chuck Shields produced a massive performance in the 3,000 meters winning the event in 9:33 with Wanderers Jeff Hayes and Matt Joosse coming in second and third in times of 9:43 and 10:36 respectively. Wanderer Polly Jansen won the women's division in 12:04. In the 800 meters, Austin Perron won in 2:11 nipping Kevin Forde by two seconds. Troy Artis was third in 2:26. Chante Moore won the second heat and the women's division in 2:32 in a photo finish over Shakira Fleming who was given the same time. Anya Curtis finished third in 2:37. Steve Metraux came back to blitz the field in the 5,000 meters winning in 16:41 followed by John Wesner in second in 18:43 and Steve Mague in 18:46. Laura Fanelli won the women's division in 19:31. But Steve and Kevin were not finished for the evening. They ran on the winning medley relay team at the end of the evening with Kevin Jude and Ted Trocky. A great performance was also produced by race director Leslie Turchetti and race officials, Chris Moore, Jim Trainor, Barbara Gorka and Teri Bizzel, coach of the Mt. 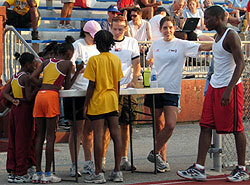 Airy Track Club who was dragooned into service as race timer. Bin Ruiter displayed his award winning culinary skills by producing a delicious meal of pulled pork and beef brisket for all the competitors and their families and fans, and Leslie cooked up some great side dishes. All in all, some 30 pounds of meat were consumed by the runners and spectators. Kevin Forde and Steve Metraux have become fixtures at the Wanderer track meets, but this year they ratcheted up their performances a few notches. 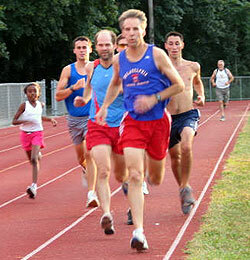 Kevin lowered his time by more than 10 seconds in the mile from his performance in 2005, while Steve improved by 10 seconds his finish in 2004 and by more than 30 seconds his 2005 performance in the 5k. A strong contingent of runners showed up from the Mt. Airy Track Club, and they impressed the crowd with their speed, form and poise. Runners from the Roxborugh CYO team were also a welcome addition to the meet. The Philly Runners club flexed their running muscles at the meet with Kevin Gruenfeld, Kevin Jude, Steve Mague, John Wesner and Craig Stone joining Seve Metraux out on the track and posting some excellent times. Some other performances should not be overlooked. Polly Jansen had barely five minutes to recover after winning the women‘s 5k before coming back to run the 800 meters and then topped off her evening's work with an 800-meter leg on the Wanderer's relay team. Laura Fanelli won the women's division in both the mile and the 5k, and Matt Joosse doubled up on the mile and the 3k. Lola, Matt and Megan working the table. The gun sounds for the second heat of the mile. to the runners in the second heat of the 800.